The Nigerian Postal Service Act, Cap N127 of 1992 has over the years, enjoyed a revered membership among the ranks of old, tired and impractical laws in the Nigerian Legal Regime. Enacted in 1992, the Act established the Nigerian Postal service (NIPOST), a corporate entity with the exclusive privilege of conveying letters from one place to another where postal communication has been established. 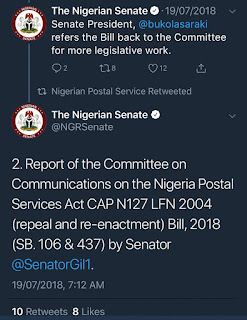 The Act was not the first legislation concerned with postal services, it in fact repealed the then existing “Nigerian Postal Service Department”. However, in recent times the NIPOST although still barely clinging to life, has been in a debilitating condition, with each passing day a loss of its relevance in the courier service industry. It is argued that a lot of factors including the rise of many international courier service companies such as FedEx, DHL and so many others; not forgetting the rise of many local logistics companies such as EFEX, GIG and so many more, might have contributed to the decline of our national postal service authority. Another factor that definitely brought this reality, was the poor administration and archaic regulatory procedures infused in the service. In truth, the Government absolute ownership and administration of such a pivotal department particularly in light of changing systems of Government from the military era to democracy was instrumental to NIPOST decline. 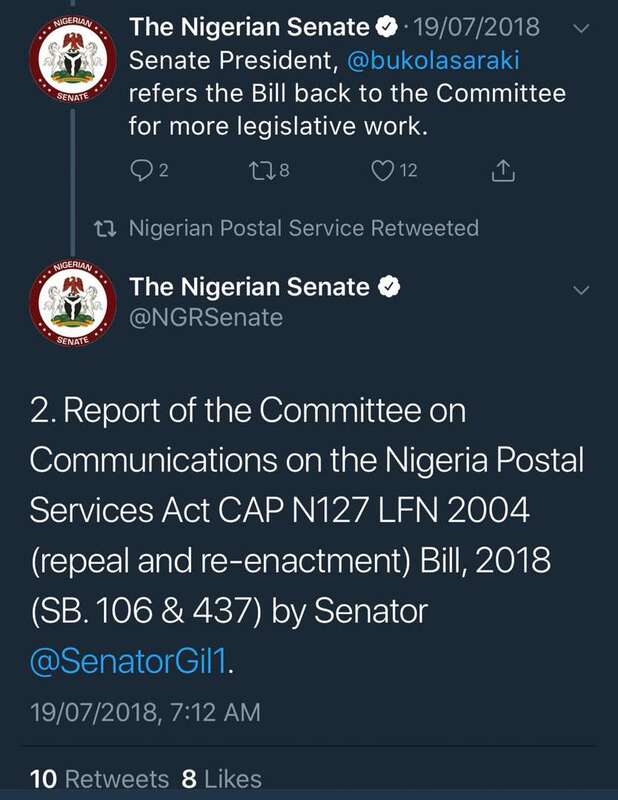 Thankfully, a BILL before the Senate for an ACT to repeal Sections 43-51 of the Nigerian Postal Service Act 1992 and the establishment of the Nigerian Postal Services Commission, passed third reading and is well on the way to become law. On 19th, July, 2018, Nigeria Postal Services Act CAP N127 LFN 2004 (repeal and re-enactment) Bill, 2018 (SB. 106 & 437) was read the THIRD time and PASSED. The courier service sector will in no distant time witness a massive reform. From the existing law, NIPOST which is a government owned corporation responsible for providing postal service in the country has been acting as both operator and regulator, a situation that has clearly impacted negatively on the growth of the public angle of the sector. According to the Honorable Minister for communication Abdu-Rheem Adebayo Shittu esq. “when the Bill is signed into law, NIPOST will concentrate on its functions as an operator in the Nigeria’s postal system, hence the need for the reforms so that it can make its pitch for a share of the deregulated Courier and Logistics”. A perusal of the bill in contrast with the existing laws reveals some unique changes. First, in Section1 (One), is the establishment of the Nigerian Postal Services Commission, this commission is otherwise, according to the bill, known as “the Agency”, basically this Bill seeks to establish the Nigeria Postal Services Commission which shall be responsible for regulating the Courier Service Industry in Nigeria in order to take its supervision and control away from NIPOST which is a player in the industry in line with the present National and global policy of liberalization and commercialization for effective service delivery and to bring the Courier Service Industry in Nigeria to international standards. A laudable strike. (b) receive applications and grant approvals, licences and renewals to deserving and competent persons applying to operate Courier Services in Nigeria. (c) set standards, guidelines and rules for the operation of Courier and other Postal Services in Nigeria. (d) the Protection and promotion of interests of consumers against unfair practices including but not limited to matters relating to unauthorized opening of sealed articles, theft, loss, diversion of and damage to parcels. (f) the promotion of fair competition in the Courier Service industry and protection of Courier Service Providers against anti-competitive and unfair practices. (g) fixing and collecting of fees in grant of licences and other regulatory services provided by the Agency. (h)making and enforcement of sanctions against breaches of the provisions of this Act or Regulations made there-under for service providers. (J) the formulation and management of Nigeria's inputs into the setting of international standards for effective Courier and Postal Services operations. (j) encouraging and promoting infrastructure sharing amongst licensees and providing guidelines thereon. (1t) examining and resolving complaints, objections and disputes between licenced operators, customers and any other person involved in the courier and Postal services industry using such dispute resolution methods as the Agency may determine from time to time including mediation and arbitration. (I) designing, managing and implementing universal Courier practices, strategies and programmes in accordance with Federal Government's general policies and objectives. (m) advising the Minister on the formulation of the general policy for the communication industry with emphasis on Courier service operations in the exercise of the minister's functions and responsibilities. (n)implementation of the Government's general policies on courier services and the execution of all such other functions and responsibilities as are given to the Agency under this Act or incidental or related thereto. (0) generally advising and assisting the Courier Services industry and its Practitioners with a view to the development of the industry and attaining the objectives of this Act and its subsidiary legislation. (P) representation of Nigeria at proceedings of international organisations on matters relating to the Courier and Postal Services industry and other matters ancillary and connected thereto. (q) the Agency shall at all times carry out its functions and duties and exercise its powers under this Act efficiently, effectively and in a nondiscriminatory and transparent manner and in a way that is best calculated to ensure healthy growth of Courier Service Operations in Nigeria subject to the regulatory controls specified in this Act, and its subsidiary legislation. Furthermore, the Bill attempts to remove all regulatory powers whatsoever from NIPOST, as seen in the repealed Sections 43-51 of the extant act, which gives powers to NIPOST to grant, renew, and revoke licenses on other courier service organizations. These powers have been bestowed solely on the Commission as indicated in the proposed part V (sections 18-30) of the Bill. (3) A person not licensed under the provisions of this section shall cease to operate Courier Services in any part of Nigeria. In conclusion, it must be understood that the Bill does not repeal the existing Act. It simply broadens the spectrum that cuts through regulation of the courier service industry. The sections repealed in the Bill are selectively chosen to quash all existing regulatory powers of the NIPOST. The Bill cleverly segregates Operation from Regulation. 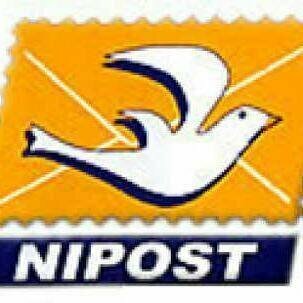 When it becomes Law, NIPOST shall become just like the other courier service companies hustling for a robust customer base, hence, testifying to governmental liberalization in the sector.